Photograph by © Miana Jun While preparing for my second mastectomy, I wanted to do something different to help with the emotional transition of losing my breast. This was to be a prophylactic surgery—I carry the BRCA-1 gene—and unlike my previous mastectomy, I had the gift of additional time to prepare for this loss. I was familiar with the idea of making plaster casts of the torso area to create a three-dimensional, life-sized memory piece. One of my friends had done this when she was pregnant, and decorated it beautifully afterward. Uncertain how to go about this process, I came across the Keep A Breast Foundation, which donates a plaster casting kit to anyone who is going through breast cancer or preventative surgery. I didn’t have a vision for the outcome, but the idea of this process resonated with me. When I went through breast cancer, I decided to have reconstruction, but I was never happy with the outcome—it neither looked, nor felt like a breast. I’m a natural sort of person and felt very uncomfortable having something foreign in my body. Although I was fairly symmetrical while wearing clothes, my natural breast looked completely different when undressed. While preparing for my second mastectomy, I decided to go flat, and have the implant removed. My ovaries also had to go, which would greatly reduce my estrogen load and my risk for ovarian cancer and breast cancer recurrence. A few stayed overnight and helped me make the torso cast in the morning. I felt vulnerable, but nurtured, as they supported me through this. Once the plaster form was thoroughly dried, it made its way to the back of my closet. Although I was grateful for the opportunity, I wasn’t sure what to do with this unusual (and large!) memory piece. There it remained for several years. I didn’t often think about it. Occasionally, I would take it out, look at it, and remember the way my body used to be when I still had one breast. One day, as I was walking at the beach mulling over some things, I stopped to pick up some shells. It felt good to hold them in my hands, to notice their shapes and textures. I put several into my pocket. Suddenly, I felt compelled to gather many more shells, as the idea of decorating my plaster cast came to mind. The sea has played a large role in my breast cancer journey. It has always provided me with tremendous comfort and helped me to find meaning and understanding in life’s ups and downs. 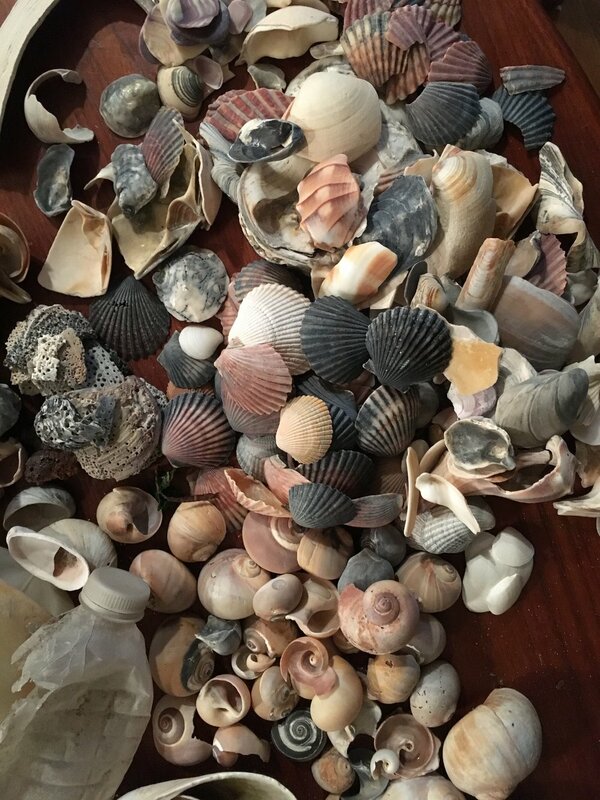 Without consciously thinking about it, I began seeking out shells that were whole. Noting the gradient of brown, tan, black, and white, I started thinking about how the seashells in Florida are so much more colorful than the shells in New York. Then I became aware of the flaw in my thinking. My life work is about empowering myself and others personally affected by breast cancer to embrace ourselves as whole and beautiful, exactly as we are. I smiled, admitting my initial mistake, and decided to gather whichever shells I felt drawn to. I was reminded that beauty lies not in seeking “perfection,” but in seeking new eyes. All it took was a simple shift in perspective for me to recognize that there was beauty all around me, in everything that I could see. Especially when immersed in nature, I appreciate the beauty within me as well. There was an empty trash bag in my pocket, as I generally gather garbage when I visit the sea. It’s one way of giving back for the many blessings I continually receive. Once my pockets were filled, I began using the bag to gather up shells. After a while, I came across the remnants of several helium balloons, plastic bags, and bottle caps. I added them to my collection, telling myself I could sort out the trash upon my return. Then it dawned on me that these objects, too, would be an important part of my art project. I vowed to use whatever I found and gathered at the sea. 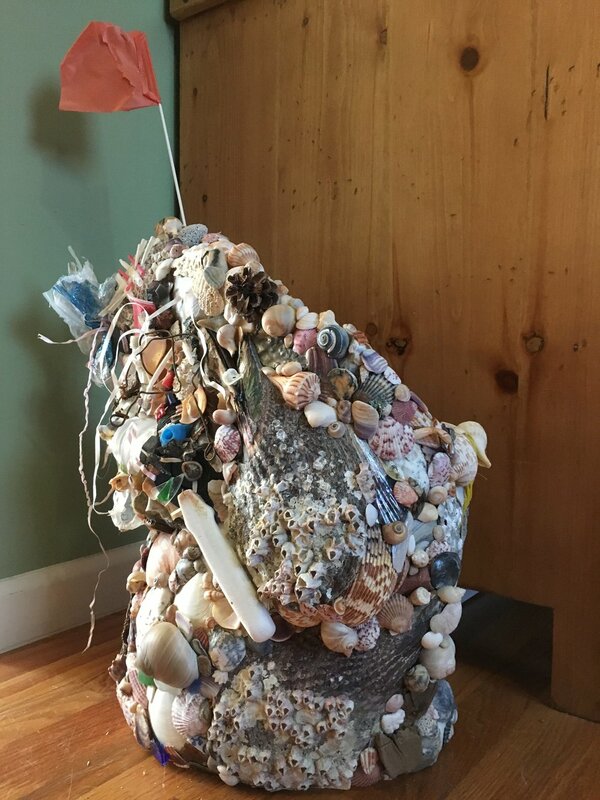 At home, I carefully sorted my treasures on the kitchen table: shells of many colors, sizes, shapes, and textures, driftwood, a rusty battery, a pine cone, many plastic straws and bottles, balloons, rusty wire, yellow rope, a knife handle with the blade rusted off, glass shards, crab legs, and smooth stones. I made piles with similar things: scallops, swirling snail shells, drift wood, small smooth bits, broken with jagged edges, iridescent, and shells with many holes. Next came the process of deciding what would go where. I loved the discovery involved in following my intuition, coupled with logic, as each piece built upon the previous, like a multi-layered puzzle. There was one large shell, covered in barnacles, and it seemed the perfect size and shape to place over the plaster imprint of my breast. A few other shells seemed to fit into place naturally. The project quickly took on a life of its own. I decorated my plaster form at night, after my children were asleep and the house was quiet. 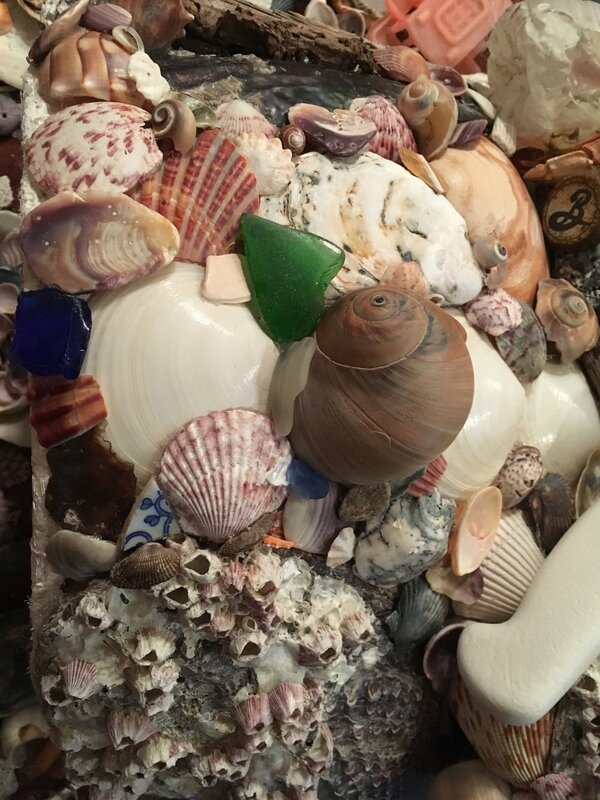 Before heading to bed, I would condense my piles, cover everything with a sheet, and then dream about arranging shells and bits from the sea until I could set aside an hour or so again the next evening. I loved every aspect of creating this art project. Broken shells and trash found their places predominantly on my “cancer side,” where my right breast had been. Other areas became an overlapping collage of three-dimensional oceanic treasures. Over time, distinct objects nestled into their proper nooks. My breast cast took on a whole new meaning for me; it tells a story—my story. It whispers the tale of where I have been, who I am today, and the woman I am becoming. I recognize that it probably looks…well, interesting or unusual to those around me. Yet, to me it is a beautiful expression of self. It speaks of my journey toward health and the self-acceptance that I imagine is a lifelong process for most who have been through the physically altering experience of breast cancer. Just as I found beauty in the shells—broken and unbroken—and even in the garbage, there is beauty in the life that I have led. There have been ups and downs. I have been broken and unbroken. It has been a journey of remaking myself, with tools I have found and cultivated through my relationship with nature, writing, and self-reflection. In the midst of it all I am reminded that I am whole, exactly as I am. My concept of beauty is for me alone to define, to embrace, and to sculpt out of seaweed and trash and hopes and dreams. Making art is a wonderful way of transforming difficult experiences. I’d like to thank the Keep A Breast Foundation for the gift of being able to create the lasting memory of my single-breasted torso, and the inner healing that sprouted from the work of decorating it. I strongly encourage any survivor, previvor, or breast cancer patient to request a free plaster casting kit. May you, too, find peace through the act of preserving the memory of your pre-surgical body, and healing through the process of transforming it into a work of personal art! Rebecca Pine was diagnosed with breast cancer in 2009. She is a writer and workshop facilitator for The Breast and the Sea, which she has co-founded with photographer, Miana Jun. The Breast and the Sea is a written and photographic project that empowers those faced with breast cancer in the process of emotional healing through personal interviews, photographic witnessing, community support, and reflective, nature-based movement workshops. Win The Ultimate VIP Vans Warped Tour Experience With Neck Deep! National Day of Unplugging - Some Ideas For A Digital Detox!